The Weston #8 pro series meat grinder is a solid unit that is ideal for processing wild game, venison and other meats while also doubling as a sausage stuffer. It is powered by a ½ HP motor to ensure fast and efficient processing of large quantities of meat, both wild and domestic. It is designed to grind between four to six pounds of meat per minute so the processing of large volumes quickly is exceptional as well as being easy. The addition of the sausage stuffing funnels really makes the Weston meat grinder a great value for the money because you are not restricted to using the ground meat for hamburger only. You get to choose between three different sizes of sausage too. The motor is permanently lubricated for long term performance and is also air cooled so that long term, safe use is assured. The commercial grinder comes with an impressive array of attachments, all made from quality materials. As you would expect from a commercial grinder designed for processing large quantities, the hopper is larger than usual so as to facilitate large quantity processing. Suitable For – anyone who requires a grinder that is capable of processing large quantities of meat. It is especially useful for hunters and commercial uses. Motor – is a powerful 1/2 –horsepower (350-watt) motor that is permanently lubricated and air cooled. Ensures fast, easy grinding. Grinding Plates – two grinding plates are provided: coarse (7mm) and medium (4.5mm), these being the sizes that best suit high volume, high speed grinding. They are made from quality stainless steel for durability and performance. Grinding Tray – is extra- large and made from stainless steel. It is also rectangular in shape for easy handling of large quantities of meat. Storage – attachments can be conveniently stored inside the stomper. The compact design of the unit also facilitates convenient storage on either a countertop for ongoing use, or in a cupboard. Handle – this is of sturdy construction and makes it easier to carry and/or transport if required. 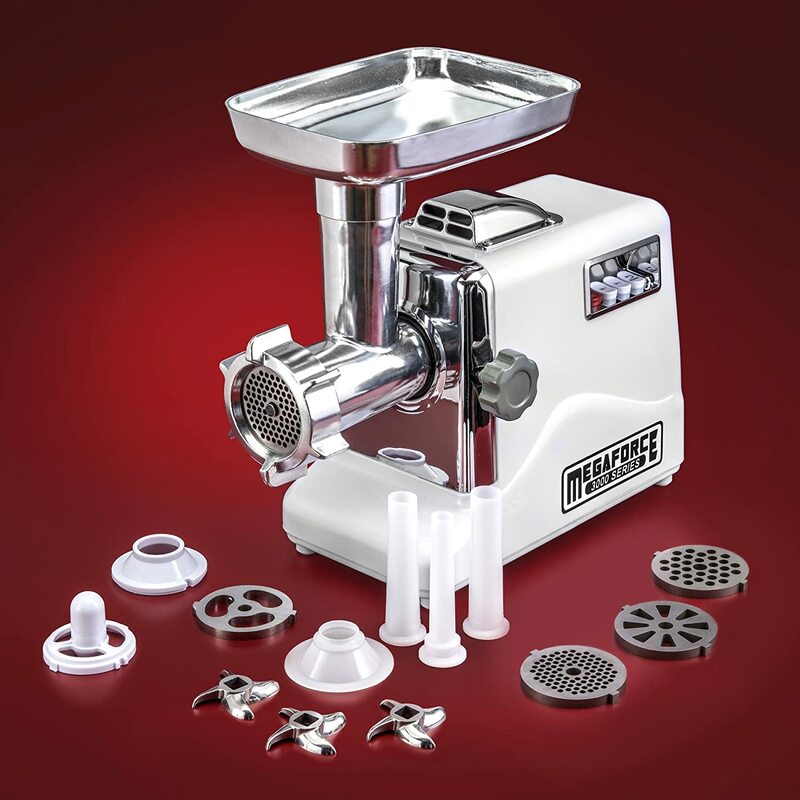 What’s Great About this Pro Series Meat Grinder? This grinder from Weston has received quite a number of outstanding reviews from customers. Things we like about the grinder include its sturdy build and quality motor, as well as its quiet operation. We also enjoy the ability to handle large quantities of meat in a short amount of time. We thought that while its price was more expensive than other commercial grinders, it was worth it for the overall quality and performance. To read about what customers had to say you can read their reviews here. The Weston #8 Pro Series Meat Grinder is available online and you can check the latest price for it here. Customers who bought this grinder feel it is a value for the money purchase because of its overall quality and performance, and inevitably found the price to be acceptable. Based on my review and Weston meat grinder reviews from customers, we are pleased to recommend it. The Gourmia GMG525 Meat Grinder is an outstanding home grinder and perfect for families. One of the best things about this grinder is that it combines functionality, quality and a great price. It is a relatively small appliance with a 500W motor and steel gears, as well as a removable grinder head and three different sized stainless steel cutting blades. Operational features include a time delay switch and a reverse switch which is also set to act as a safety feature. The unit is ETL certified. These features ensure that it is easy to make your own mince, sausage and kibbeh. Assembly is fast, and as long as you observe the recommended grinding procedure, which includes cutting and chilling the meat before you begin grinding, the grinding process is quick and efficient. You can create delicious, nutritious meat meals as well as personalize your meat blends and seasonings while knowing that harmful additives are not included in the menu. 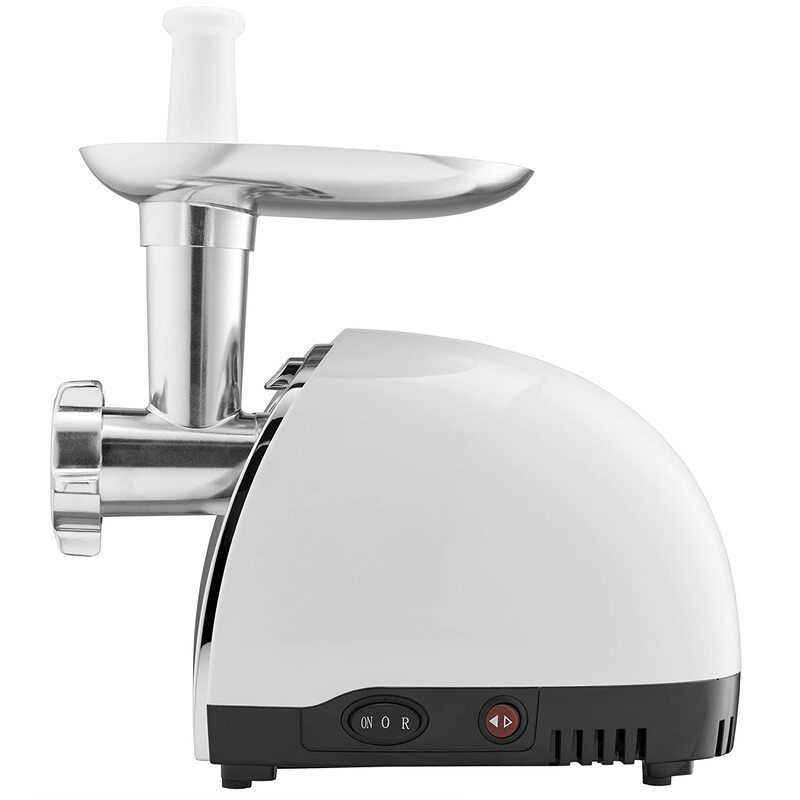 The Gourmia GMG525 Meat Grinder has a high level of functionality and is made from quality components. Gourmia is committed to producing reliable appliances that are easy to use, as well as making sure you have the ability to create fresh nutritious meals using freshly ground meats. This meat grinding appliance enables you to create a variety of sausages, meatballs and patties that you know will contain no additives other than the spices, seasonings and the herbs that you add yourself. A recipe book is included to provide an idea of the type of meals you can make. The unit comes with three different sized cutting blades – course, medium and fine, a sausage attachment and a kibbeh maker. Additionally, you will also receive a recipe book and a food pusher. Together with steel gears and a 500W motor, it is ideal for household use. Short answer? Anyone who is looking for a meat grinder that is well made, reliable, well priced and overflowing with quality. Assuming you are aware of the benefits of grinding your own meat, all that remains is for you to select a suitable meat grinder from the many that are readily available. If you appreciate high functionality and performance within the home appliance sphere, at an excellent price, this meat grinder is for you. Unless you prefer to use a hand meat grinder… and there is nothing wrong with that if you love the old fashioned way of grinding meat or live off grid. For those who embrace the frenetic modern lifestyle, but who still want to make their own sausages and burgers, the Gourmia GMG525 is a good option. It will save you one of the most valuable commodities in modern life… time. If you hoard time like precious gold nuggets, this electric meat grinder is for you. It is fast and efficient, good quality and not expensive. Customers love many things about the Gourmia Meat Grinder with functionality being at the top of the list. They love the excellent product quality and that the machine is well made. The 500W motor is ideal for household use and while not an expensive unit, like many others on the market, grinds through a variety of meats quickly and efficiently. Customers like that it is easy to put together and use, as well as having a choice of three grinding disks. Like most electric meat grinders, you can choose from coarse, medium and fine grinds. The grinder cleans up easily but it needs to be done by hand. Check the manual for cleaning instructions and note that cleaning by dishwasher is not recommended. Does the Product have any Minor Downsides? Just a couple that customers mentioned. The first is jamming while grinding. An easy fix is to make sure the meat is well chilled and only grind for ten minutes before giving the machine a rest… then back to grinding. Of course, not overstuffing the machine will also help. Read more customer reviews online. There are plenty of meat grinders to choose from and the products below are but a few of the many available. As with most purchases, the criteria can differ between buyers, however, functionality, quality and the money you are prepared to spend or able to afford, will determine which particular meat grinder you decide to purchase. Betitay Electric Meat Grinder, 1800 Watts Max Locked Power Heavy Duty Meat Grinder Stainless Steel Mincer Food Grinder with 3 Cutting Plates, Kubbe Attachment and Sausage Stuff Makers, ETL Approved. Sunmile SM-G33 ETL Electric Stainless Steel Meat Grinder Mincer Max 1HP 800W, Stainless Steel Blade and 3 Grinding Plates, 3 Types Sausage Makers. Ivation 1800 Watt Electric Meat Grinder Mincer, Sausage Maker/Heavy Duty with 3 pcs Stainless Steel Cutting Blades, Kibbe Attachment & Sausage Stuffing Tubes. The Gourmia GMG525 Meat Grinder is definitely worth the price paid and ideal for household use. It includes a 1 year warranty and customers attest to its high quality and functionality. It is suitable for beginner and experienced grinders alike but as always, make sure the product is a fit with your budget and expectations. The LEM Products .75HP Stainless Steel Electric Meat Grinder is a good value and has proven popular with customers. Essentially, the price point is competitive with lower powered grinders, but LEM offers a more powerful and quality grinder. The extra power ensures that the grind time will be fast, around 360 pounds of meat per hour. So if you need machine that can handle large quantities, such as grinding venison, this LEM “big bite” is the one to choose. LEM also makes a .35 HP meat grinder however the more powerful .75 HP model is the one that serious grinding aficionados purchase. Weighing in at 47 pounds, the LEM meat grinder is solid and durable, complete with a heavy duty handle. The addition of the handle is clever because it allows users to easily move it from place to place, despite the heavier weight. It also features all metal gears which adds to the durability of the unit. The LEM #12 meat grinder also comes with an attractive stainless housing and a powerful motor which includes a safety feature, namely a circuit breaker. The motor is permanently lubricated and the auger features ‘Big Bite’ performance so that it pulls meat into the grinder quickly and easily. Motor – is a powerful .75 HP and is designed to support the fast grinding performance of the unit. Gears – are metal gears and have roller bearings to improve performance functionality and durability. Grinding Speed – is fast so you should have the meat prepared in advance so you can keep feeding the meat pan. It can grind 360 pounds in an hour, should you desire to do so. Stuffing Tubes – three stuffing tubes (3/8, 3/4, 1 ¼ inches) are included for mixing and matching with the grinding plates. Mix and Match – grinding plates with the stuffing tubes to provide plenty of choice. Meat Tray – is a reasonable size at 11.5 x 8.5 x 2.25 inches so that you can keep it loaded and prepared. Auger – uses ‘Big Bite’ technology and is ETL Certified to UL Standards. It is designed to quickly pull the prepared meat into the grinder to facilitate fast grinding performance. Handle – is solid and heavy duty so that you can lift and move it easily. This is a good idea because the grinder is weighty, however the functional handle removes barriers with regard to the weight. Safety – there is a circuit breaker built into the unit so that immediate shutdown of the grinder will occur in the event of motor overload. What’s Great About the LEM Products Meat Grinder? This popular LEM 12 Meat Grinder is rated very highly by customers. We give it a 4.7 out of 5 stars based on its features, quality, performance and warranty. I expect the new model to perform even better. Things customers like about it include its quality, fast performance, easy clean-up, power, as well as its appearance and durability. You can read online reviews for the newest model here. The LEM Stainless Steel meat grinder is available online and you can check out the latest price for it here. This LEM meat grinder is a hit with customers who value its quality, functionality and performance. They felt the price point was worth it because of the quality of the product. Based on customer feedback, our experience, the high rating customers give the product our brief experience with the grinder and the excellent warranty we are pleased to recommend this LEM #12 meat grinder. The LEM Products Stainless Steel .35 HP Electric Meat Grinder is ideal for home use. Many customers use it for making their own pet food, processing their own venison and well as other ground meats. The three grinding plates and correspondingly sized stuffing tubes also allows for home sausage making. If you want to eat healthier, tastier meats rather than consuming store bought processed meats, the LEM #8 meat grinder is the perfect machine. It comes with a large meat pan and a ‘Big Bite’ auger which literally pulls the meat down from the pan into the tube, resulting in a fast grinding process. In fact, should you be so inclined, it can grind around 240 pounds of meat every hour. Most customers would process smaller quantities though and still be able to freeze some for later use. The LEM 8 meat grinder is made from stainless steel, as are the grinding plates so construction is solid. The motor is .35 HP and has an automatic shut-off features should the grinder become clogged. The solid build and powerful performance of the LEM meat grinder has ensured it is a popular appliance. Meat Tray – measures 11.5″ x 8.5″ x 2.25″ so you can load it up with plenty of pre-chopped meat. It helps the grinding process to proceed rapidly because it is not necessary to keep loading small amounts of meat into the feed tube. Availability of Spare Parts – there is an extensive parts inventory available in the event that something should need to be replaced. Cleaning – is not difficult and a cleaning kit is available to ensure you can reach hidden nooks and crannies. Safety – the motor will automatically shut off in the event of the machine becoming clogged. This ensures no damage will occur to the motor and thereby prolonging its life. What’s Great About the LEM #8 Meat Grinder? Feedback for the LEM #8 – .35 HP Stainless Steel Electric Meat Grinder is outstanding, a testament to the LEM meat grinder product line. Things customers like about it include its solid stainless steel construction, grinding speed, the ‘big bite’ food auger, quality build and quiet operation. 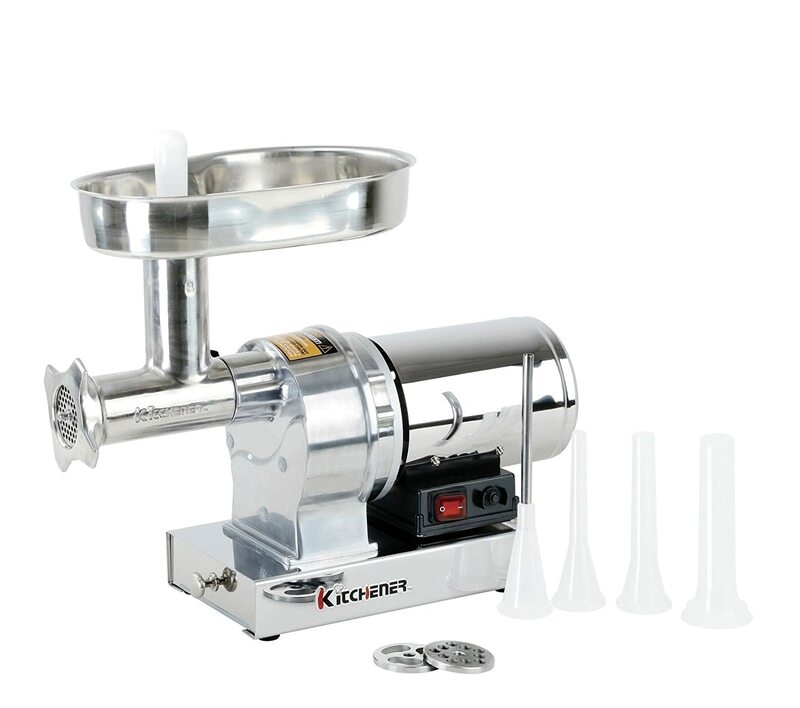 Many customers use the LEM #8 meat grinder for making their own pet food and like the way it can power through bone. To read more about what customers have to say, you can check out their reviews here. The .35HP LEM Meat Grinder is available online and you can find the latest price for it here. The LEM meat grinders are popular with customers, the majority of whom gave the model an excellent rating for its quality, overall functionality, performance and warranty. Based on customer feedback and the reputation of the company, we are pleased to recommend it. LEM grinders have a reputation for being quality meat grinders and the 1 HP model is no exception. This is a heavy duty meat grinder in every sense of the word as it is heavy in terms of weight as well as being capable of powering through meat and bone in large quantities at a fast speed. Should you wish to do so, it is capable of grinding 550 pounds of meat in as little as one hour, courtesy of its powerful motor. The LEM 1 HP meat grinder is all stainless steel and doesn’t use plastic parts in critical areas such as the auger or drive gears. The 100% stainless steel used throughout the grinder is why it is so heavy. It is not a lightweight metal with a shiny coating. The motor is permanently lubricated so that maintenance is not required and a built in circuit breaker has also been included in the design. This grinder comes with standard cutting plates and sausage stuffing tubes as well as a stainless steel knife. Customers have noted that the LEM meat grinder is more expensive than its competitors however they felt the high quality of the product was definitely worth the extra cost. Cutting Plates – three are included, being fine, coarse and stuffing – they are made from stainless steel in keeping with the overall quality of the grinder. What’s Great About the LEM Meat Grinder? The LEM Products 1 HP Meat Grinder has received outstanding ratings from customers. Things they like about it include its quiet operation, heavy duty build, large size, powerful motor and lack of required maintenance. They are particularly impressed with the speed of the grinder and appreciate the time they save by using it. To read more about what customers think about the LEM meat grinder, you can read their reviews here. The 1 HP LEM Products Meat Grinder is available from online retailers and you can check out the latest price for it here. Customers are universally impressed with this meat grinder and are particularly impressed with the speed at which it operates. Saving prep time is an important part of preparing and processing home ground meats. Customers are happy to pay for the quality of the product and don’t mind the heavier weight and larger storage space needed. Based on our experience with the grinder and customer feedback, we are pleased to recommend the 1 HP LEM meat grinder. If you are looking for a quality meat grinder, there are many to choose from, so it is pleasing to find one that comes with ringing customer endorsements regarding its quality and performance. The LEM 1.5HP grinder costs more than similar smaller grinders available, but as customers point out, over the longer term it is more cost effective to buy one quality product than several cheaper models. Even though it is a large meat grinder, it presents an opportunity to achieve value as well as a well-built, solid and powerful kitchen appliance. The LEM Products #32 Stainless Steel Electric Meat Grinder is a quality, heavy duty product that is well suited to grinding large quantities of meat quickly. It can grind up to seven hundred and twenty pounds of meat in an hour, should you wish to do so. The combination of a powerful motor together with the unit’s heavy duty build ensures high speed functionality. The LEM grinder can be used for commercial purposes because of its heavy duty build. You should make sure, prior to purchase that you have sufficient space available to use and store it, as it is a large and heavy appliance. Motor – is an induction motor and permanently lubricated to aid longevity of the unit. One customer found that larger bones such as chicken legs can cause the grinder to jam, however cutting them into smaller pieces solved the issue. Customers leaving reviews for the LEM #32 Meat Grinder gave it an excellent rating. Things they like about it include its power, speed, quality build, performance and solid feel. They also like the easy clean functionality and the performance of the auger. To read more about customer feedback, you can read customer reviews here. The 1.5HP LEM Meat Grinder is available from Amazon and you can find the latest price for it here. Customers were full of praise for this product and felt its performance and functionality were worthy of its price. The LEM #32 is a quality built powerful and durable meat grinder which customers believe saves them money, not only through grinding their own meat, but by needing to purchase only the one grinder as opposed to several cheaper grinders of lesser quality. Based on customer feedback, the LEM #32 is a ‘must have’ meat grinder and we are pleased to recommend it. The Kitchener #8 Commercial Grade Electric Stainless Steel Meat Grinder is a great choice for home use. It combines sturdy and durable stainless steel construction with a variety of convenient features for safe, effective operation time after time. 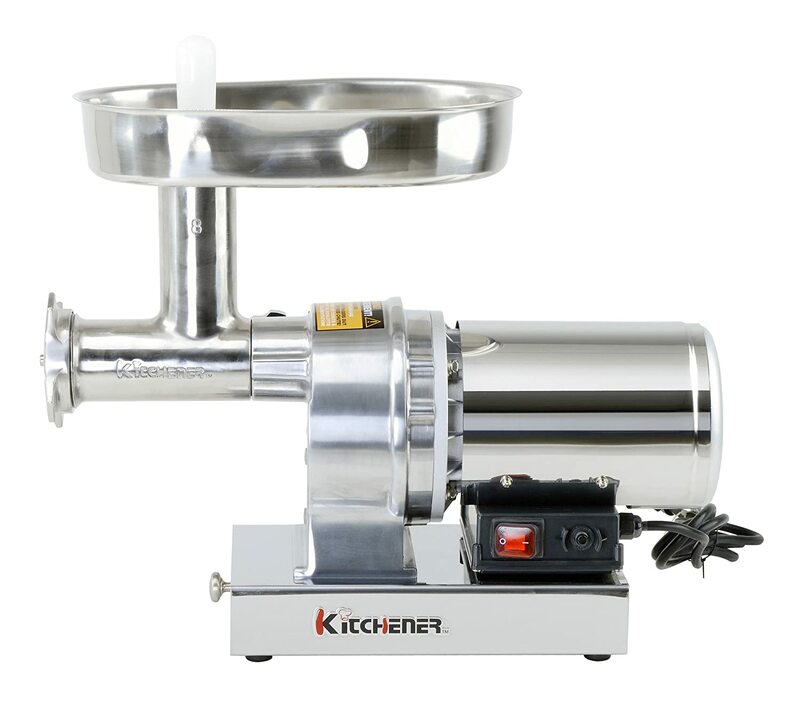 The Kitchener meat grinder brings professional quality grinding to the home kitchen at a fraction of the cost of other commercial grade grinders. The heavy-duty SUS304 stainless steel housing includes a water-proof switch which prevents rusting for exceptional strength and long-lasting durability. The 370W – ½ HP induction motor grinds up to 480 pounds of meat per hour to take on large jobs with ease. The steel gear-driven mechanism and air-cooled motor provide greater grinding power and quiet operation while a circuit breaker enhances safety. The stainless steel meat pan is a generous 13” x 9” x 2-3/8” and is designed with an enlarged throat to take on larger volumes of meat in a faster period of time. The large capacity makes the Kitchener grinder ideal for grinding large volumes of meat by restaurants or small meat processing shops. The Kitchener is a good choice in homes where large quantities of meat are processed regularly. The Kitchener #8 includes the features that matter the most when grinding meat at home. The grinder is highly versatile and functional with a stainless steel coarse (3/8″), fine (3/16″) grinding and stuffing plates, four stuffing tubes (3/8″, 1/2″, 3/4″, 1-1/8″), stainless steel cutting knife, and solid meat stomper. The grinder works great for making sausage, but buyers also use the home appliance to make raw pet food, ground hamburger, and a lot more. The simple answer is that anyone who wants the benefits of an affordable commercial grade meat grinder with a lot of added features should buy the Kitchener #8. Even beginners who have never used a meat grinder before can enjoy the benefits of a home grinder like the Kitchener. Grinding your own meat comes with numerous advantages including having control over the quality of meat that goes into the food you eat. A lot of pet owners are turning to meat grinding as an alternative to buying commercial dog food for the health of their pets. Anyone who appreciates a great value for a home appliance should give the Kitchener #8 a try. It’s a great investment that will pay off in a number of ways. Many people still rely on manual meat grinders that fit onto the edge of a table or kitchen counter. These require hand cranking and a lot of energy. For exceptional quality results on a larger scale, the Kitchener #8 is a more convenient and practical option. It gives you complete control over the quality of ground meat and the consistency you want from your meat products. There’s nothing wrong with manually grinding meat when you work on a small scale. If you need to grind a lot of meat, it’s going to take more time to do it by hand than most people have to spare. With the Kitchener, you can do the job to perfection in a fraction of the time. The grinder comes with a 30 day return policy and a 1 year warranty. There’s a lot to love about the Kitchener meat grinder starting with the heavy-duty stainless steel construction. Unlike grinders made with a tin coating or plastic, it has the strength to withstand big jobs for a long time. We like that the Kitchener is easy to assemble and use without a big learning curve. There’s also an easy-to-follow video to get you started and you can download the user’s manual for additional information. We also like the large capacity meat pan and enlarged throat that allows the grinding of more meat at one time. The patented design of the removable drawer also makes it easy to organize grinder accessories and keep everything handy when you need it. The stainless steel construction makes the electric grinder easy to clean and it gives a professional appearance that looks nice in any kitchen. There are a few minor changes we would like to see changed. For one, the body of the grinder is made from plastic and not stainless steel. This area of the grinder is finished to blend in with the rest of the grinder and it doesn’t impact its strength or durability. All of the working parts are made of stainless steel and deliver heavy-duty performance. Also the fact that the guard in the tray makes it difficult to feed large pieces of meat into the grinder. This feature prevents over-stuffing the throat and causing it to become blocked. On the flip side, this feature doesn’t get in the way of the grinder’s ability to grind up to 480 pounds of meat in just one hour. There are lots of choices when it comes to electric meat grinders including those listed below. Making the right choice depends on the buyer, how they will use the appliance, and how much they want to spend. Betitay Electric Meat Grinder, Stainless Steel, Heavy-duty Food Processing, 3 Grinding Plates, Sausage Making Kit, 1800 Watts, Blade & Kubbe Attachment, Multifunction, ETL Approved, High Power, Low Noise. STX International, Electric Meat Grinder, #12, Polished Aluminum Grinding Head, 2000 Watt Main Grinding Unit, International Turboforce II, Patented Air Cooling, 6 Grinding Plates, 3 Stainless Steel Cutting Blades, Foot Pedal Control, Set of 3 Kubbe & Sausage Tubes, Kubbe Making Attachment. Gourmia GMG525 Meat Grinder, 500 Watts, ETL Approved, 1000 Watts, 110/120V, 3 Stainless Steel Grinding Plates in Fine, Normal, and Coarse, Bonus Accessories Kit, Sausage Horn, Free Recipe Book. The Kitchener 52020806 #8 Commercial Grade Meat Grinder is a great value and is ideal for small restaurants and home use. We along with customers that have purchased agree that the grinder is high quality and highly functional for a variety of uses. It is easy to use and more affordable than many lower quality grinders available. The KitchenAid Meat Grinder Attachment has been designed to increase the versatility of a KitchenAid stand mixer. If you do not want the expense of a dedicated meat grinder and need something suitable for domestic use, this attachment is ideal. It isn’t intended for only grinding meat, you can utilize the coarse grinding plate for things like dried fruits, cheese and firm vegetables. The fine grinding plate is perfect for making bread crumbs and grinding cooked meat for making spreads. The food grinder is compatible with any KitchenAid stand mixer with a power hub and if you have ground meat, it is worth considering other attachments like a sausage stuffer for even more versatility. If you are seeking to increase the versatility of your stand mixer, these attachments are ideal. What’s Great about the KitchenAid Attachment? This KitchenAid Grinder Attachment has received an incredible number of excellent reviews and is a testament to its quality and reliability. Things customers like about it include its ability to easily attach to the mixer, easy clean up, in-product-storage of knife and blades, sturdy build and easy assembly. It is important to note that a significant number of customers, approximately 10%, found that the grinder produced metallic shavings in with the ground meat as compared to the majority of customers who had no issues with it. To read more about what customers had to say, you can read their reviews here. The KitchenAid Meat Grinder Attachment is available from online retailers and you can find the latest price for it here. The majority of customers found the attachment to perform satisfactorily however there is a small minority of people that are very unhappy with the metallic shavings they found in their ground meat. This is a situation where you can go with the majority or take notice of the customers who experienced the metallic shavings. In either case, you need to make your own judgement call on this one based on the reviews.